﻿ Free Dharma Teachings Project for the benefit of all sentient beings. » Blog Archive » Ven. Rizong Rinpoche: Bodhicitta and Emptiness. Ven. Rizong Rinpoche: Bodhicitta and Emptiness. Ven. 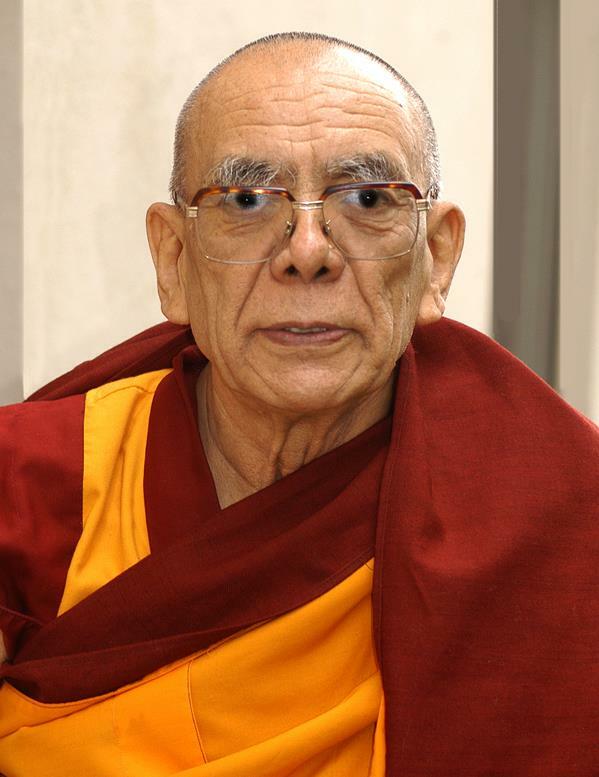 Rizong Rinpoche: The root of suffering should be fully understood. Brief teaching conferred on August 28, 2009 by Ven. Rizong Rinpoche at Rizong Labrang, Leh, Ladakh, JK, India. Transcription and editing by Dr. Luciano Villa and Eng. Alessandro Tenzin Villa for Free Dharma Teachings Program for the benefit of all sentient beings. Treanslation by Mr. Tenzin Tzepag. Then after developing Bodhicitta http://www.sangye.it/altro/?cat=73 we are approaching to sunyata. In this process in two phases, first we have to generate compassion and then is it possible to develop Bodhicitta, compassion is the most important. We have to see all sentient being suffering, but this suffering isn’t accepted by sentient being, this is the main root of compassion. We have to realize that we are suffering in samsara, first thinking on our suffering and then to the others sufferance. Then we can develop Bodhicitta. Without realizing the samsara and his sufferance, is very difficult to develop Bodhicitta. Compassion is the principal root of Bodhicitta. Anyway we have to be aware to be in samsara, the realm of suffering. In Buddha texts, also in Kangyur, is clearly mentioned that, if someone isn’t able to drink neither a cup of water, how is he able to drink the water an ocean? If you are not able to do the basic practice of sutra, how can you perform high tantra practice? Step by step we go on following the path: that is very important. Therefore, in order to be able to perform the Mahayana tantra practice, we have to develop compassion, joy, love, equanimity: basically you need to develop Bodhicitta. Without renunciation there is no Bodhicittia, without Bodhicitta no sunyata. In order to develop Bodhicitta or compassion we have to realize that Samsara is suffering. Buddha teaches us that there are three types of suffering. We have to feel ourselves among these three suffering, this is most important. SUFFERENCE of SUFFERENCE is related to physical or mental illness, because of stress we suffer a lot of troubles; every time, every moment if we think very sensibly we feel suffering. SUFFERENCE of CHANGING is related to the continuous changing and instability in our daily life; for instance, in the morning we get up very happy, then unfortunate situations make us very unhappy, this is what is called “changeable suffering”. If now you are feeling cold then, exposed to strong sun rays, you will feel too hot, this is what is called “changeable suffering”. OMINIPERVASIVE SUFFERENCE is related to the sufferance of samsara, to the suffering of this body in samsara, in all of its realm there is suffering. This sufferance derives from this samsaric body. Every being is afflicted by this kind of suffering. Also the realm of God, and demi gods, everyone experience it. Because of this body you become sick, because of this body you die, everyone is exposed to sufferance. Therefore this is the main reason which enhances us to escape from samsara. This was the first teaching of Buddha after he got enlightenment. Let’s see which is the first noble truth. The noble truth of suffering; without realizing that we are suffering we can’t desire to escape. First we have to realize these three types of suffering. Therefore we wish liberation and then begin our bodhisattva practice. First we have to realize by ourselves these three kind of suffering, then we realize that all sentient being are suffering, therefore we have to develop in our mind compassion and joy. If we see some people suffering, sick, we feel compassion in their regards because we have that feeling: the desire that every sentient being will be free from suffering. If we see some people living in a very comfortable house, we are wishing the same like them but we don’t feel compassion. We are not developing that compassion because of our selfishness. Therefore if someone lives in a very comfortable way, many people are thinking: “I also desire the same like him”. But we don’t feel a sense of compassion in his regards. While desire is an obstacle, on the other hand, understanding the suffering is very important in the liberation path. Therefore let’s consider the second Bodhicitta practice. For all the time we have to think to all sentient beings. If we think that some people have money, good house, we have to remember that this favorable situation can change. Every moment their wealthy way of life can change in a poor style of life. For all the time we have to think to suffering. To develop Buddhist compassion, firstly we have to realize and understand our suffering secondary others suffering. There is some connection in this reasoning. Let’s us start thinking that all sentient being were our mother because of the unending number of our previous rebirth which put us in connection with all sential beings. Texts suggests two ways to develop compassion: one is by Chandrakirti http://www.sangye.it/altro/?p=3259, http://www.sangye.it/altro/?p=3263, and another one is by Shantideva http://www.sangye.it/altro/?p=4145. Chandrakirti says that we have to acknowledge all sentient being because of their deep kindness. Why they are and they have been so kind? Because in the innumerable number or death and rebirth every sential being has been our father and mother and took care of us. In this way we have to think to really develop Bodhicitta. On the other hand Shantideva says that, also without mother connection, every sential being has been however kind with us because alone I can’t still be alive. Shantideva way of thinking is better because in Chandrakirti way of thinking there is a little bit of attachment. Shantideva thinking is completely free from attachment. Mother love children but this is not real compassion because in her feeling there is also some attachment. This is the way to think interdependently. All sentient beings has been very kind to us. In any moment of our life we depend from kindness of other sentient beings. For instance, the tea I’m drinking is the result of the efforts of a lot of people. Without the contribution of others we cannot survive and we cannot derive anything also from the point of view of the spiritual results. Secondly, our human precious life derives from the past merits, and these merits comes from the sentient beings. Without the others we cannot have anything. Thinking higher, we can obtain a great liberation then also enlightenment, because of the sentient beings we can reach this result, these results are also connected with the sentient beings. If you are not so much in friendship with someone, you say: “I don’t like him, he is my enemy”. But according to the Mahayana practice there is no enemy among sentient beings. People are very selfish, if there is no enemy you have no patient. Patience is also one of the most important paramita. Enemy is very important. Only because of the enemy you can practice patience. Among the six paramita, patience, generosity, first three paramita cannot be practice without the others sentient being. Because of that, all sentient beings are connected with somebody. This is related with you and me, this connection you have to think then you can develop compassion. For example one mother, only one children we have to extends to all sentient beings this mother compassion without her attachment, this is called great compassion. Mother thinks if my son s sick, if i get sick doesn’t matter but the important think is he get free from sick. These is to see other suffering. When in this samsara everything is impermanent, in this way we have to think to develop renunciation. The root of suffering should be fully understood and everyone will be happy this kind of think you have to put in you mind to develop Bodhicitta. We have to think in this way, but we have no power to heal them. How to have this power? Therefore first I have to get Buddhahood through practice and then help them. Until we get enlightenment we can’t help. Therefore without sunyata practice we can’t stop all these things. To know the reality of the Dharma we need the perfection of wisdom then do sunyata practice. With the perfection of wisdom we get now the true reality of the Dharma. Sunyata means reality of the Dharma, we are now looking a table, this is a table but according with the reality this is not a table. we are seeing some object we are thinking this is the reality, many causes, factors creates reality. If you separate one by one you find nothing. We have attachment to the I, because of this body, aggregates, mind, because of all these things we give a name also. Body is not I, consciousness is not I. Indians masters there is rope, we are thinking some snake is there. It is a kind of a poison. If you go and check the reality there is only a rope. In some part of India there are many snakes, the poisons of snakes, people have fear to find out a snakeskin their out. People pay attentions to snakes and they find snake in normal objects. We are thinking I, we are always proud. Because of I idea all sentient beings all objects become my. Finally we realize that is not the snake, it is only a piece of rope. If the reality of I you come to know a sense of equanimity arises. Doubt is very bad, because lead us to commit errors. Doubt is not unknown but has to do with a confused mind. These kind of three practices: mahayana, bodhisattva practice, tantra practice, renunciation first, bodhicitta then sunyata these three are very important. Attachment arises from desires, if I destroy desires also attachment is destroyed. These are very very great teaching. Tsong Khapa receives these three practices directly from the Manjusri. We never say to completely stop any kind of desires. Attachment to types we have to know, samsaric desires we have to stop. Desire as I want to get liberation, enlightenment but these kind of desires are outside smsara. desire which wishes the benefits of all sentient beings. Actually its very common meditation, everyone says I practice meditation. According to the Buddhism is to put our mind near to the virtue. First concentration is very important then analytical meditation. What is happening in samsara. Meditation is now putting on the virtue side.